At APEC 2015, Vishay Intertechnology will be highlighting its latest industry-leading power MOSFET, passive component, and diode technologies for a wide range of applications. The Vishay Siliconix 40 V TrenchFET® SQJQ402E is the industry's first AEC-Q101-qualified MOSFET to feature the 8 mm by 8 mm by 1.8 mm PowerPAK® 8x8L package, and the first in an 8 mm by 8 mm package with J leads. To save PCB space in automotive applications, the SQJQ402E offers similar on-resistance and higher continuous current than devices in the D²PAK while reducing the footprint area and profile by 60 %. To save power, the MOSFET offers half the on-resistance, twice the current, and a 21 % smaller profile than devices in the DPAK, all with only a 12 % larger footprint. Unlike the D²PAK and DPAK packages, the PowerPAK 8x8L is totally lead (Pb)-free. Vishay will highlight its new 600 V and 650 V Trench insulated gate bipolar transistor (IGBT) platform featuring Punch Through (PT) and Field Stop (FS) technologies. Designed to increase efficiency in motor drives, UPS, solar inverters, and welding machine inverters, the Vishay Semiconductors devices offer low collector-to-emitter voltages and fast and soft turn-on and turn-off for low conduction and switching losses. The IGBTs are optimized for use in power modules with Vishay's new FRED Pt® Gen 4 Ultrafast soft diodes. The Vishay Draloric AC05..CS 5 W axial silicone cemented, fusible wirewound safety resistor is the industry's first such device designed to ensure safe and silent fusing operation during overload conditions while offering surge voltage withstanding capability up to 6 kV (1.2 µs / 50 µs). For electric appliances, energy meters, and power supplies, the UL1412-recorgnized AC05..CS combines a fusing time of < 45 s for a 100 W overload with a special non-flammable silicone cement coating for immediate interruption without flame and explosion when AC mains voltage (230 VAC) is applied. 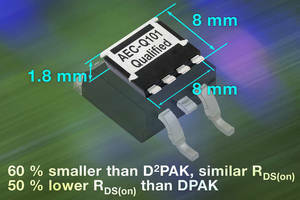 The Vishay Semiconductors SE10DxHM3/1, SE12DxHM3/1, and SE20DxHM3/1 AEC-Q101-qualified 100 V to 600 V standard rectifiers combine ESD capability with a wide range of current ratings from 10 A to 20 A. For space-constrained applications, the devices are offered in the SMPD (TO-263AC) package, which features an extremely low 1.7 mm profile and is footprint-compatible with the D²PAK. Featuring low forward voltage drops down to 0.96 V typical at 12 A, the rectifiers reduce power loss and improve efficiency for general purpose power line polarity protection in automotive applications. Vishay will showcase the new VS-ENQ030L120S, VS-ETF075Y60U, VS-ETF150Y65U, and VS-ETL015Y120H IGBT power modules designed specifically for string solar inverters and medium-power-range UPS. Combining Ultrafast Trench IGBTs, high-efficiency HEXFRED® and FRED Pt® diode technologies, and thermistors for easy thermal management in single EMIPAK-1B and EMIPAK-2B packages, the Vishay Semiconductors modules offer complete integrated solutions for inverters based on 3-level neutral point clamp (NPC) topologies and interleaved multiple-channel MPPT (maximum power point tracking) boost converters. Vishay will introduce a new series of hybrid ENergY storage capacitors — ENYCAP™ — with low 2.5 mm profiles and industry-high energy density of 13 Ws/g. Offering designers exceptional flexibility and enhanced charge and discharge performance for energy harvesting and power line backup applications, the Vishay BCcomponents 196 HVC ENYCAP series is available with a wide variety of layouts, capacitance values, and voltage ratings. For medical equipment and other electronics in which reliability and stability are primary concerns, the Vishay Beyschlag MMA 0204 HV and MMB 0207 HV professional high-voltage thin film MELF resistors combine a robust construction with high continuous operating voltage to 1000 V and a surge voltage rating to 3 kV. Ideal for applications in extreme environments, the Vishay Draloric VSGR combines high power capability up to 20 kW with a wide operating temperature range of -25 °C to +250 °C. Providing protection IP00 to IP23 and a robust design, the new device is optimized as a converter and brake resistor in windmill, solar, diesel generator, turbine, and railway applications. Offering a rugged design for motor drives and LED drivers in industrial and lighting applications, the Vishay BCcomponents PTCSL03 mini leaded PTC sensing thermistor offers a fast response time, a wide range of protection temperatures from +80 °C to +150 °C, excellent long-term behavior, and accurate resistance to simplify circuit designs. Vishay will introduce a new automotive-grade low-profile, high-current inductor featuring an integrated e-shield for reduction of EMI in the compact 4040 case size. Lowering costs and saving board space in automotive and other applications by eliminating the need for separate board-level shielding for the inductor, the Vishay Dale IHLE-4040DC-5A contains the electric field associated with EMI in a tin-plated copper integrated shield, providing up to 20 dB of electric field reduction at 1 cm (above the center of the inductor) when the integrated shield is connected to ground. HEXFRED, FRED Pt, and ENYCAP are registered trademarks of Vishay Intertechnology. TrenchFET and PowerPAK are registered trademarks of Siliconix incorporated.